One week ago, the Red Sox were part of one of the biggest trades in baseball history. While most of the focus has been on the talent leaving Boston, our job is to focus on the talent coming back. SoxProspects Executive Editor Chris Hatfield examined the haul from the Dodgers, and Director of Scouting Chris Mellen wrote a detailed report on Allen Webster's (pictured) first start in the organization. Webster is the top-rated prospect received in the deal, debuting at fourth on the SoxProspects rankings. As the minor league season winds down, the Red Sox have begun to ramp up the promotions. Jeremy Hazelbaker, Keury De La Cruz, Brock Huntzinger, and Bryce Brentz were all promoted this week. Bryce Brentz put together one of the finest weeks seen all year at the plate, posting a .536/.552/.893 line (15-for-28) with two home runs, four doubles, 10 RBI, and a stolen base in six games played en route to SoxProspects.com Player of the Week honors. In his marquee performance of the week August 22 at New Britain (MIN) Brentz went four-for-five with two home runs and a double, scoring three runs and batting in four as the designated hitter. On the season, he is hitting .292/.351/.472 (135-for-462) with 17 home runs, 30 doubles and one triple over 124 games, all but two of which came with Portland before his promotion this week to Pawtucket. Brentz is currently the seventh ranked prospect in the Organization by SoxProspects.com, this is his second Player of the Week honor. The Carolina League, South Atlantic League and Gulf Coast League each announced their post-season All-Star teams today, and several Red Sox prospects received recognition. Outfielder Keury De La Cruz was the lone representative from the Greenville Drive, while the High A Salem Red Sox had five players chosen: outfielder Jackie Bradley, Jr., shortstop Xander Bogaerts, third baseman Michael Almanzar, catcher Christian Vazquez, and designated hitter Travis Shaw. 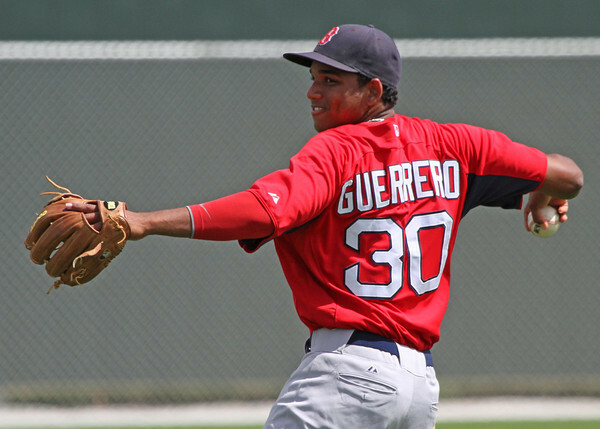 Pitcher Sergio Gomez was named in the Gulf Coast League, along with outfielder Jeremias Pineda, who saw much of his production in the league before his early-August trade to the Twins. 8/30 Cup of Coffee: Jeremy Hazelbaker got his first Triple-A RBI, the Salem Red Sox and the Greenville Drive were each part of extra-inning victories, and the Spinners shut out their opponent. The Sea Dogs were nearly shutout, and the GCL Red Sox lost their championship. Jeremy Hazelbaker got his first hit and a pair of RBI since being promoted to Triple-A and the PawSox defeated the Gwinnett Braves (ATL), 9-4. The PawSox recovered from their first deficit when Tony Thomas hit a RBI triple to tie the game in the third. But the Braves scored two more runs in the third and added another in the fourth to make the game 4-1. Thomas trimmed the deficit again in the fifth, belting a two-run homerun, and Hazelbaker hit his first RBI single to tie the game. The game remained tied going into the top of the ninth, and the PawSox managed to score four runs before recording an out. Danny Valencia, Andy LaRoche, and Jason Repko hit back-to-back-to-back RBI singles, and Jonathan Hee managed an infield single for a RBI after Dan Butler walked. After the pitching change, Hazelbaker added one more run by grounding into a force out. Steven Wright started the game allowing four runs (three earned) on seven hits over 5.0 innings. Josh Fields, Rich Hill, and Alex Wilson combined for 4.0 innings of scoreless relief. Fastball: Webster’s fastball clocked at 91-95 mph during the outing, with the majority sitting 92-93 mph. The pitch showed hard sinking action and strong movement. His heater maintained the sink in the upper reaches of the velocity, while also constantly moving downward in all tiers of the strike zone. It is a true power sinker at his disposal. Webster generated easy velocity, with little effort in his delivery and the type of looseness to reach back or choke down without any difference in the delivery. Throwing 48 fastballs in the start, he featured the pitch often, but struggled to execute it consistently to either side of the plate. His command and control graded as fringe-average overall. Webster threw it for strikes 52 percent of the time, with a lot of those strikes coming on foul balls or balls put into play. He did not generate a swing-and-miss. Four of the six hits he allowed came against his heater as he left it in the middle of the plate frequently, especially during the first two frames. There were also a handful of mistake fastballs he got away with in the same area that batters did not get around on. According to Salem Red Sox announcer Evan Lepler on Twitter, Keury De La Cruz has been promoted from Low-A Greenville to High-A Salem. De La Cruz, 20, has had a breakout season this year for Greenville, hitting .308/.352/.536 with eight triples, 19 home runs and 81 RBI. The left-handed De La Cruz was originally signed as an international free agent in the spring of 2009 and has been an All-Star for two consecutive seasons with Lowell and Greenville. Photo credit: Keury De La Cruz by TJ Lawrence. In an announcement this afternoon, the Arizona Fall League released its roster's for the upcoming 2012 campaign. The Red Sox representatives will be playing for the Surprise Saguaros this season and are sending outfielder Bryce Brentz along with pitchers Chris Martin, Pete Ruiz and Brock Huntzinger to the southwest. The Red Sox are expected to send another representative or two as the roster forms into shape after the season is complete. Brentz, 23, has put together a stellar season at Double-A Portland, hitting .298/.357/.481 with 17 home runs and 76 RBI. The 2010 first round selection will be making his Fall League debut. In what was supposed to be a pivotal year in his development, Kolbrin Vitek’s 2012 campaign has been stunted by a recurring back injury that has limited the Red Sox’ top pick in 2010 to just 46 Double-A games this year. 8/29 Cup of Coffee: The GCL Sox lost game one of the Gulf Coast League finals as Portland and Salem were the only victorious squads on Tuesday. Pawtucket's contest with the Gwinnett Braves (ATL) was postponed due to rain. The game will be made up as part of a doubleheader on Thursday. A six run explosion in the 12th inning allowed Portland to overcome the New Hampshire Fisher Cats (TOR), 9-3. Allen Webster made his Red Sox system debut by tossing 4.0 innings, allowing three runs on six hits and two walks, punching out seven. Mike MacDonald was stellar in relief, hurling 7.0 innings, allowing two hits and two walks while striking out six. The two teams got off to a quick start, with New Hampshire scoring one in the first and two in the second while the Sea Dogs responded with runs in the first three frames. The game remained knotted until the 12th, when a Bryce Brentz RBI single brought home two and a Travis Shaw (pictured) three-run home run highlighted an offensive outburst. Shaw was 3 for 5 to lead the offense while Christian Vazquez, Shannon Wilkerson and Derrik Gibson each added two hits. The International League announced its 2012 award winners today, and Mauro Gomez (pictured) has been named the league's Most Valuable Player. Gomez appeared in 100 games this season for the PawSox in between promotions to the major league club. During his time in Triple-A, he has managed to lead the International League with a .589 slugging percentage and 59 extra-base hits. Gomez also ranks among the top five with a .310 batting average, 24 home runs, 34 doubles, and 74 RBI. Gomez, 27, was signed in the offseason as a minor league free agent to provide depth at first base and designated hitter. He made his major league debut on May 13 after appearing in over 700 minor league games. Originally signed by the Texas Rangers organization in 2004, Gomez also played two seasons in the Braves system. He has appeared in 14 games for the Red Sox this season, including starts in the last five, going 14 for 48 with a home run and six RBI. 8/28 Cup of Coffee: It was a quiet night on the farm, with only three affiliates in action. Pawtucket pitchers tossed a three-hitter, expanding the wild card lead, Lowell rode early offense to victory, and Portland dropped its third straight. With a week to go in the regular season and a razon-thin lead in the wild card standings, Pawtucket got excellent pitching in a 3-1 victory over the Gwinnett Braves (ATL). Nelson Figueroa (pictured) was excellent, taking a no-hitter into the seventh inning. In all, he allowed only one run on three hits in 7.1 innings, striking out four and walking two to pick up the victory. Rich Hill tossed a perfect inning and hasn't allowed a run in the 4.0 innings since his Pawtucket rehab assignment began. Chris Carpenter retired the final two batters of the game, getting credit for the save and lowering his ERA to 0.61. Dan Butler drove in all three of Pawtucket's runs, with the big hit being a two-run home run in the second inning. It was the first time Butler had gone deep since his promotion from Portland earlier in the month. Also notable was the Triple-A debut of Jeremy Hazelbaker, who was promoted earlier in the day. Hazelbaker got the start at DH and went 0 for 4. Pawtucket radio broadcaster Aaron Goldsmith is reporting that outfielder Jeremy Hazelbaker has been promoted from Double-A Portland to the PawSox. The promotion comes on the heels of today's recall of Ryan Kalish to the major league club. With Pawtucket short an outfielder as they attempt to make a playoff push, and Hazelbaker's second half play got him the nod. Hazelbaker, 25, gets the news of his promotion a day after hitting two solo home runs in the Sea Dogs 5-3 loss to Binghamton, giving him a total of 19 on the season. After a slow start to 2012, Hazelbaker's production has taken off in the second half, hitting .313/.358/.595 in 163 at bats, including 10 homers and 16 stolen bases. Overall on the season, the left-handed hitting outfielder has a .273/.338/.479 line. 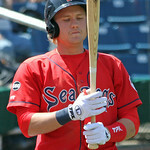 Capable of playing all three outfield positions, the bulk of Hazelbaker's playing time in 2012 has come in left field. One month into the season, as Drake Britton scuffled along in his second Carolina League campaign, the hard-throwing left-hander sat down for breakfast with pitching coach Kevin Walker and hitting coach Rich Gedman after a fourth rough start in five tries. Both knew that Britton wanted nothing more than to make it to Portland—that he’d wanted nothing more before he was even assigned to Salem last season. But with every short start, Britton saw that goal growing farther away. 8/27 Cup of Coffee: The GCL Red Sox advanced to the GCL Championship Series, the PawSox jumped past the Lehigh Valley IronPigs (PHI) in the Wild Card standings, and the Drive got another walk-off win. The PawSox moved into sole possession of the Wild Card spot with a 5-4 win over the Charlotte Knights (CWS). Nate Spears led off the fourth inning with a triple and came around to score on a Ryan Kalish sacrifice fly. Newly acquired Ivan De Jesus singled in the sixth and scored on a Tony Thomas single to put the PawSox up by two. The Knights came back to score two in the sixth and one in the seventh to take the lead. Chris Hernandez allowed the two runs in the sixth, while Daniel Bard allowed one run on two hits in the seventh. 8/26 Cup of Coffee: The GCL Red Sox won the South Division title on the last day of the regular season, and the PawSox stayed a half game behind the IronPigs (PHI) in the Wild Card hunt despite sporting a new-look lineup. With the bases loaded and two outs in the bottom of the ninth, Josh Fields came on to get a strikeout to end the game, as the PawSox defeated the Charlotte Knights (CWS), 4-3. The PawSox lineup looked much different after the promotions of Jose Iglesias and Che-Hsuan Lin to Boston, but after Tony Thomas (pictured) hit a two-run home run to put the PawSox up by three in the third, it seemed as though the PawSox were not going to miss a beat. After the Knights scored two runs in the fifth, the PawSox got a much needed insurance run in the sixth as Jason Repko scored on a wild pitch. The breaking news of the Red Sox's blockbuster trade with the Dodgers took fans to a place they never really had been before. In trying to get our heads around the massive, nine-player, nearly $300 million deal, most of the focus has been, rightfully so, on the players leaving Boston: Josh Beckett, Carl Crawford, Adrian Gonzalez and Nick Punto. Never had we seen a group of major league players owed this much in contracts shipped out in the same trade. Never had we seen a general manager, Ben Cherington, so swiftly put his stamp on a team, making it his own. But perhaps getting lost in the hubbub about who the Sox jettisoned is that they managed to get real value in return for those players, in addition to getting the Dodgers to pay just about $260 million of the more than $270 million owed to those four. Boston received two potential impact arms in Rubby De La Rosa and Allen Webster and useful bench pieces in Ivan De Jesus and Jerry Sands, while James Loney rounds out the deal as the man who will take over first base for the rest of this season. On Tuesday, Jackie Bradley Jr. slipped and twisted his ankle running the bases. 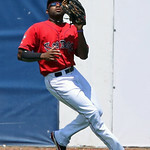 SoxProspects.com’s Senior Columnist Jon Meoli followed up with Bradley Jr. and reports that the injury appears to be minor and that he hopes to return to the lineup soon. Meoli also wrote this week about the dramatic change of the Double-A Portland Sea Dogs' roster after many players have been promoted from High A Salem. Portland is still under .500 for the season, but 28-12 since the All-Star break and are only 4.5 games out of a playoff spot. Brandon Workman introduced himself to the Eastern League in style going 2-0 with an 1.64 ERA in his debut, allowing two earned runs on seven hits, striking out eight while walking only one, easily earning himself SoxProspects.com Pitcher of the Week honors. He worked six shutout innings against Altoona (PIT) August 14, striking out six while allowing only two hits and no walks. Against New Britain (TOR) August 19 Workman allowed two runs on five hits, striking out two and walking one over five innings of work. Prior to being promoted Workman went 7-7 with a 3.40 ERA in 113.2 innings over 20 starts with Salem, for a combined 9-7 record with a 3.25 ERA over 124.2 innings pitched, with 115 strikeouts versus 21 walks and held opposing batters to a .239 average. 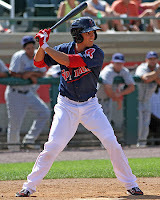 He is currently the thirteenth ranked prospect in the organization by SoxProspects.com. 8/24 Cup of Coffee: A 17-hit outburst has the GCL Red Sox a win away from clinching the playoffs, while Pawtucket ended up on the wrong side of a pitcher's duel, unable to expand its wild card lead. An anticipated debut wasn't enough to keep the DSL Red Sox from falling out of postseason contention. Portland, Greenville and Lowell all picked up wins as well. Despite the efforts of Zach Stewart, Pawtucket was unable to expand its lead in the International League wild card race, falling 2-1 to the Charlotte Knights (CWS). Stewart was excellent, allowing two runs on only four hits in 7.0 innings, striking out four without a walk. The big blow was a two-run homer off of Stewart in the fourth by former Red Sox outfielder Conor Jackson, accounting for all of Charlotte's scoring. Rehabbing left-hander Rich Hill allowed one hit in a scoreless eighth inning, but the PawSox offense could not get anything going. Andy LaRoche reached base three times, finishing 1 for 2 with a walk, HBP and a double. He also scored Pawtucket's lone run on a fourth-inning Dan Butler single, but that was the only time a PawSox player got even as far as third base, as they were stymied by Charles Leesman and a pair of relievers. 8/23 Cup of Coffee: Bryce Brentz hit two home runs, Blake Swihart hit a walk-off home run, and Keith Couch and William Cuevas pitched spectacularly in a positive night for nearly all of the affiliates, save the GCL Red Sox. Bryce Brentz hit two home runs and the Sea Dogs defeated the New Britain Rock Cats (MIN), 7-2. The Sea Dogs jumped out to an early three-run lead when Brentz hit a RBI double and Xander Bogaerts hit a two-run single in the first. The Rock Cats chipped away and were within a run by the fourth inning, but Brentz extended their lead with a solo shot in the fifth. The Sea Dogs scored three insurance runs in the seventh inning on a RBI double from Jeremy Hazelbaker and another two-run home run from Brentz. Stolmy Pimentel pitched well in his second consecutive start, allowing two runs (one earned) over 6.0 innings and striking out four. Chris Martin and Michael Olmsted combined for 3.0 scoreless innings out of the bullpen. Olmsted has not allowed a run since his promotion to Portland. As the minor league campaign winds down and focus and performance can begin to wane, Double-A Portland has received a shot of life in the second half with a slew of top prospects joining the club for the stretch run. NEW BRITAIN, Conn. -- Portland center fielder Jackie Bradley Jr. said Wednesday before the Sea Dogs’ series finale with New Britain that his left ankle injury was minor, and he hopes to be back in the Sea Dogs’ lineup soon. 8/22 Cup of Coffee: Two teams fighting for their playoff lives picked up victories on Tuesday while Portland took home an extra-inning thriller and the remainder of the affiliates stumbled. The rehabbing Daisuke Matzusaka had perhaps his best start of the season as Pawtucket held the Rochester Red Wings (MIN) to one hit in a 3-0 victory. Matzusaka hurled 7.0 shutout innings, allowing just one hit and four walks while punching out seven. Josh Fields added 2.0 scoreless innings of relief, striking out four to pick up his first save with the PawSox. Nate Spears' solo home run in the first inning proved to be all the offense necessary for Pawtucket. However, Ronald Bermudez added an RBI triple in the fifth to give Matzusaka a bit more breathing room. The PawSox now sit a game and a half up in the wild card race over Lehigh Valley (PHI). ESPNBoston: Who'll get September call? With roster expansion less than two weeks away, let’s take a look at the players that the Red Sox may promote from the minors to add to the active roster in September. In the past five years, the club has added somewhere between seven and 12 minor leaguers to its active roster each September, in varying capacities. Some have come aboard as impact role players, while others have joined the club just to get their first taste of a major league clubhouse atmosphere. Similarly, some are added immediately on Sept. 1 when the active roster limit expands from 25 to 40, others are not promoted until Triple-A Pawtucket’s season ends (which is Sept. 2 this season, but could be later as the PawSox have a good chance at making the playoffs), and still others are only promoted for a cup of coffee during the final week of the season. 8/21 Cup of Coffee: On a full slate of Monday games down on the farm, Portland had a costly extra-inning victory, while the GCL and DSL affiliates both held on to early leads. After falling into an 8-1 deficit, Pawtucket chipped away but could not complete the comback, falling 9-6 to the Rochester Red Wings (MIN). Starter Nelson Figueroa was roughed up, allowing eight runs – seven earned – on five hits without escaping the third inning. The bullpen then stepped in and kept the PawSox in the game, starting with 3.1 innings of shutout pitching by Tony Peña, Jr. Peña allowed only one hit and did not walk a batter while striking out a pair. Rich Hill followed with an easy one-two-three inning in his first appearance since his rehab assignment was transferred to Pawtucket. Daniel Bard had an encouraging performance, pitching a scoreless eighth inning and ending strings of four consecutive appearances allowing a run and six in a row in which he'd walked a batter. I recently touched on the pitching depth within the organization. While there has been progress with seeing the development of some arms that can make an impact at the major league level down the line, the overall theme is that the organization still has some ways to go. The Red Sox minor league system is far deeper when it comes to position player prospects. In recent seasons, there has been a crop of talent emerging within the ranks. This year third baseman Will Middlebrooks made the jump to the big leagues and before his season ending wrist injury was showing he can handle the transition to being a major league regular. Let’s take a look at how things have shaped up in the upper minors as the minor league season winds down. Assessment: I’ve been able to scout Bogaerts since 2010 when I first saw him down at the Fall Instructional League, and he has continued to show impressive progression for a player his age. His raw power and ability to impact the baseball jumped out when first seeing him, but I needed more of a handle on his hit tool initially. Bogaerts showed the early clues of being able to stay inside the baseball to go the other way, along with keeping his hands back on his body when attacking breaking balls. These were promising signs for a young hitter. The goal entering this season on a scouting level was to continue to evaluate his consistency within these areas. Spring training gave a good initial glimpse as Bogaerts was focused on staying back to use his quick wrists, lining one particularly impressive home run out to right field. NEW BRITAIN, CONN. -- Portland manager Kevin Boles and center fielder Jackie Bradley, Jr. were optimistic after Monday's 4-3, 10-inning win over New Britain (MIN) that the first inning left ankle injury that forced Bradley out of the game was not serious. "He was able to put weight on his foot, weight on his ankle, but it was a scary moment," Boles said after the game. "We're going to get things right, and we're going to make sure he's feeling in better shape." 8/20 Cup of Coffee: Xander Bogaerts and Jose Iglesias continued to be two of the toughest outs in the minors, and JT Watkins played his last game before reporting to the Army. Jose Iglesias (pictured) continued to be one of the hottest hitters in the system, as he led the PawSox past the Bisons (NYM), 4-1. Iglesias got the PawSox on the board with an RBI single in the third – one of his three singles in the game. Billy Buckner contributed a quality start, allowing one run over 6.0 innings, and Pedro Beato earned the save in his PawSox debut, striking out three over 2.0 innings. Nate Spears walked three times and scored twice, and Andy LaRoche added a double and an RBI. 8/19 Cup of Coffee: All was not fun and games at the annual “Futures at Fenway” game on Saturday afternoon when 2012 Red Sox first-round pick Brian Johnson took a line drive to the face on only the second pitch he threw. It was an inauspicious omen to a game that the Spinners eventually lost by a run. The PawSox also suffered defeat in the nightcap. The rest of the affiliates had similarly frustrating nights, with the Sea Dogs splitting a doubleheader for the only victory of the night. The Pawtucket offense was unable to offer run support to a solid start from Chris Hernandez and fell to the Buffalo Bisons (NYM), 2-0 in the nightcap of the “Futures at Fenway” event. Hernandez allowed two runs on four hits over 6.0 innings. The Pawtucket offense was hardly able to string any hits together, and Jonathan Hee had the only extra-base hit of the night. Josh Fields and Chris Carpenter combined for 3.0 scoreless innings out of the bullpen. Boston Red Sox pitching prospect Brian Johnson was hit in the face by a line drive at Saturday's Futures at Fenway event and left the field on a stretcher. Johnson suffered multiple orbital bone fractures on the left side of his face but is showing no signs of a concussion and is resting comfortably at the hospital, the Red Sox said in a statement. Johnson, who earned the start for the Single-A Lowell Spinners in the opening game of the annual minor league doubleheader at Fenway Park, was facing Hudson Valley center fielder Joey Rickard, the Renegades' leadoff batter, when he suffered the injury. 8/18 Cup of Coffee: The PawSox and Spinners had mixed results before they traveled to Boston for today's Futures at Fenway, and the PawSox could not come through in the clutch against the Yankees. The PawSox left 11 men on-base, as they fell to the Yankees (NYY), 8-5. The PawSox had 13 base runners in five innings against Yankee starter Adam Warren, but only managed to push across two runs. The Yankees had eight base runners in five innings against Zach Stewart, but scored five times. Jon Hee (pictured) had one of his best games of the season, going 3 for 3 with a home run and two walks, and Juan Carlos Linares went 3 for 5 with a double and a home run. Linares has seen his numbers drop since his promotion to Triple-A, as he is walking less and striking out more, but his power is still there. Jose Iglesias stayed hot, going 2 for 4 with a walk, and he is now batting .317 with a .394 on-base percentage in August. 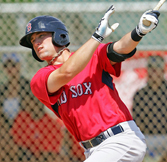 2012 3rd round selection, Austin Maddox (pictured) made his professional debut with the Rookie-GCL Red Sox. Maddox is 0-1 with a 3.00 ERA in 3.0 innings pitched across two appearances thus far. In a minor trade this week, the Red Sox sent catcher Kelly Shoppach to the New York Mets in exchange for reliever Pedro Beato. Beato, 25, cracked Baseball America's top 100 prospects list in 2007 and is expected to debut shortly with Triple-A Pawtucket. 8/17 Cup of Coffee: On an eventful night down on the farm, a 15-hit outburst led Greenville, a pair of Portland pitchers knocked off a premier Pirates prospect, while Salem, the Red Sox of the GCL and DSL also received top-notch work on the mound. A late rally doomed Pawtucket, while Lowell faced a former top pick. Pawtucket failed to hold an early 4-1 lead and dropped a 5-4 decision to the Scranton/Wilkes-Barre Yankees (NYY). Daniel Bard struggled mightily in relief, taking the loss. In Bard's 1.0 inningof work, he allowed three unearned runs, walked two, hit a batter and committed a throwing error. Bard has 12 walks in 5.2 innings in his last six outings. Chris Carpenter followed with a hitless eighth inning, running his scoreless streak to nine consecutive appearances. Andy LaRoche and Juan Carlos Linares both homered for Pawtucket. The Red Sox have acquired right-handed reliever Pedro Beato from the New York Mets, reports Keith Law of ESPN.com. The deal completes the trade earlier in the week that sent catcher Kelly Shoppach to the Mets. Beato, 25, spent all of the 2011 season on the Mets major league roster after choosing him in the Rule 5 draft. In 67.0 innings over 60 relief appearances in 2011, he went 2-1 with a 4.30 ERA, striking out 39 and walking 27. Beato missed the first two months of the 2012 season with right shoulder soreness, and struggled upon his return, giving up five runs in 4.1 innings over seven appearances before being optioned to Triple-A Buffalo. In 24 Triple-A appearances this year, Beato has a 4.14 ERA and 1.162 WHIP. Cup of Coffee 8/16: Deven Marrero and Mookie Betts had big contributions in the Spinners victory; Drake Britton had a solid outing despite scarce run support, and Randy Perez struck out nine in four innings to pave the way for a DSL Red Sox victory. The rest of the affiliates had mixed results with the PawSox splitting their doubleheader with the Yankees and the Salem Red Sox, Greenville Drive, and GCL Red Sox all suffering losses. The PawSox fell to the Scranton/Wilkes-Barre Yankees (NYY), 5-1, after starter Daisuke Matsuzaka fell apart in the fifth inning. Matsuzaka had yielded only a second-inning single before allowing the first six batters he faced to reach base in the fifth inning, resulting in five runs (four earned). Matsuzaka pitched 5.2 innings, allowing five hits, striking out five and walking two in his 10th rehab start with Pawtucket. He is 0-3 with a 3.68 ERA in 44.0 innings with 34 strikeouts and 13 walks. The sole PawSox run came in the second inning when Jason Repko brought Mauro Gomez home on a sacrifice fly. Northeast Scout Ian Cundall files his latest report after his recent swing out in the field. Follow him on Twitter @IanCundall for live scouting coverage from the parks. -In limited action, Brian Johnson has shown the stuff and polish to validate a first-round selection in the 2012 draft. Starting off his career with Lowell in the New York-Penn League, Johnson has shown a deep repertoire combined with better-than-advertised velocity. Reports from his time in college had Johnson sitting in the high-80s and topping out in the low-90s, but he has seen an uptick in his velocity since entering the system. In the two outings I scouted, his fastball sat 90-94 mph and topped out at 95 multiple times during his last start on August 9. The uptick in velocity is likely due to his current usage, where he is limited to two-inning stints where he doesn’t have to worry about holding velocity deeper into games. His ability to hold velocity next year shouldn’t be an issue though, as he is already well filled out and has a smooth, repeatable delivery from a ¾ arm slot. Johnson gets good downhill plane on his fastball and it has some late arm-side action. The rest of Johnson’s repertoire consists of two breaking balls, a slider and curveball, and a changeup. Thus far, Johnson has primarily used his curveball to complement his fastball. The pitch ranges from 73-79 mph and showed good bite on occasion, missing bats. Johnson’s slider is harder, coming in at 80-83 mph, but he only threw it a few times, showing good depth on one occasion. Finally, Johnson mixed in a changeup that came in 84-85 mph. The pitch showed good drop when thrown, but again it was used sparingly in the outings. With his four-pitch mix and solid command of all his pitches, Johnson easily overwhelmed hitters at the current level. Next year will provide a better test of Johnson’s ability as he will likely start at Salem, where he will encounter more advanced hitters who are used to seeing pitchers with polish and the ability to throw multiple secondary pitches for strikes. Members of the GCL Red Sox Nick Moore and Sergio Gomez swept this week's SoxProspects.com Player and Pitcher of the Week honors, respectively. In six games Nick Moore batted .375/.483/.833 (9-for-24) with three home runs and a triple, with six runs scored and five batted in, five walks and strikeouts, and a stolen base. Moore's best outing came at the GCL Twins last Saturday going two-for-three with a home run, one run scored, three runs batted in and a stole a base. On the season Moore, age 19, is batting .255/.378/.376 (38-for-149) with three home runs, five doubles and two triples in 43 games played. He was the Red Sox thirtieth-round pick in the 2011 draft. 8/15 Cup of Coffee: Brandon Workman made a nearly flawless Double-A debut as Portland reigned supreme on Tuesday evening. Pawtucket and the GCL Sox also pulled off victories, while Salem and the DSL Sox suffered late-inning collapses. A seven-run fourth inning allowed the PawSox to be on the winning end of a slugfest against the Scranton Wilkes-Barre Yankees (NYY), 9-7. Billy Buckner picked up the victory for his 5.0 innings of work, allowing five runs on six hits and three walks while punching out two. The freshly promoted Josh Fields continued his early dominance at the Triple-A level, hurling 2.0 scoreless innings and striking out two. Daniel Bard added 0.1 innings of relief that could be only classified as ugly, allowing two runs on four walks. Pawtucket's major offensive blow came in the fourth, when Andy LaRoche smashed a two out grand slam that came as part of a seven run barrage. Mauro Gomez added an RBI double, and Juan Carlos Linares went 4 for 5 with two runs scored and an RBI to pace the PawSox offense. WILMINGTON, Del. --- A day after Salem used four relievers, including spot starter Manny Rivera, in suffering a 9-1 beating, right-hander Keith Couch gave his team the consistent, steady start they’ve come to expect from him in Salem’s 2-1 loss to Wilmington (KC) Saturday night. 8/14 Cup of Coffee: NESN picked a good night to showcase some of Pawtucket's top talent at its best, Rich Hill struggled in his first rehab appearance in the GCL, and the DSL Red Sox fell in the 15th inning after a thrilling comeback. With the major league squad off, Pawtucket made the most of its opportunity to impress the NESN audience, beating the Buffalo Bisons (NYM) 5-1. Three pitchers combined for a four-hitter, as Chris Hernandez had his strongest start since his promotion to Triple-A. The crafty left-hander tossed 6.0 innings, giving up a run on three hits, walking one and striking out seven. Chris Carpenter pitched a perfect seventh inning to earn the win, his first since joining the Red Sox organization. Carpenter now has a miniscule 0.75 ERA in twelve appearances for the PawSox. Jose De La Torre finished off the win with 2.0 innings, allowing one hit and striking out two. The knuckleballer may be seen as a dying breed by many fans of the game of baseball, but the Pawtucket Red Sox's newest pitcher thinks that R.A. Dickey of the Mets is proving the knuckleball's value is still as strong as ever. 8/13 Cup of Coffee: Andrew Bailey is looking like he is ready for Boston, while Lowell continued its scorching pace. Zach Stewart lasted only three innings, as the Buffalo Bisons (NYM) beat the PawSox, 9-3. Stewart threw 75 pitches over his 3.0 innings of work, allowing three runs on five hits. Mark Prior continued to struggle in relief, allowing two runs in 1.2 innings, and he has now allowed eight runs in his last 15.1 innings. Andrew Bailey was the lone bright spot for the pitching staff, as he threw 1.1 hitless innings, striking out one. He has allowed only one run in 6.1 innings on his rehab assignment, while striking out 10. Mauro Gomez (pictured) went 2 for 4 with a double and a home run, and Che-Hsuan Lin went 2 for 3 with two walks. 8/12 Cup of Coffee: Both Lowell and the DSL Red Sox won in their last at-bat, while the GCL Red Sox held off a late comeback. Portland and Salem both dropped tough one-run losses, and Pawtucket was doomed by an eighth-inning rally. At Rochester's Frontier Field, Pawtucket missed their chance to sweep its two-game series, losing 5-3 to the Red Wings (MIN). Steven Wright made his PawSox debut, and the knuckleballer was solid, allowing two runs on five hits in 5.0 innings of work. Josh Fields followed with a pair of perfect innings, striking out three. Daniel Bard struggled in the eighth inning, taking his first loss with the PawSox. Bard gave up three runs in his 1.0 inning of work, allowing three hits, walking one and hitting a batter, while striking out two. Che-Hsuan Lin led the offense, going 3 for 3 with a walk, an RBI and a run scored. Portland fell 5-4 in a tough walk-off loss to the Erie SeaWolves (DET). Tied 4-4 in the bottom of the ninth, Brock Huntzinger surrendered a lead-off home run to Daniel Fields to give the Sea Wolves the win and ending Huntzinger's scoreless streak at five outings. Not to be missed in the loss were some excellent offensive performances. Xander Bogaerts had his third two-hit effort in as many games with Portland, going 2 for 4 with a double. Christian Vazquez and Bryce Brentz also had a pair of hits apiece, while Jackie Bradley went 1 for 3 with a pair of walks. Salem struggled to generate offense, dropping a 2-1 decision to the Wilmington Blue Rocks (KC). Keith Couch tossed 5.0 innings, allowing two runs on six hits, striking out four and walking two in a tough-luck loss. Will Latimer kept the game close, striking out four in 3.0 shutout innings, but the offense could not break through against Wilmington pitching. Salem's lone run came on a third inning solo home run by Carson Blair. Felix Sanchez had a pair of hits for the Red Sox. Greenville's match-up with the Savannah Sand Gnats (NYM) was cancelled due to rain. Per a Savannah press release, the game will not be made up. Top pick Deven Marrero (pictured) broke a 5-5 tie with a 13th inning solo home run, making the Spinners 6-5 winners over the Hudson Valley Renegades (TB). Marrero's shot gave Lowell its fourth consecutive win and 13th in its last 15 games. Overall, Marrero finished the night 2 for 7 with an RBI and two runs scored. 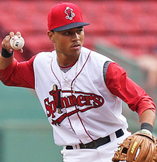 Dreily Guerrero, recently named to the New York-Penn League All-Star game, led the Spinners with three hits, including a double. Jadd Schmeltzer earned the win, going 3.0 shutout innings, striking out two and walking one, and Greg Larson earned his first professional save by pitching a scoreless 13th. Three of the top pitching prospects in the lower levels of Red Sox system saw action in the GCL Red Sox 6-3 win over the GCL Twins. Fourth round pick Ty Buttrey got the start, giving up one unearned run on one hit in his 1.0 inning of work, striking out two and walking one. Second rounder Jamie Callahan followed with 2.0 shutout innings, allowing only one hit while walking and striking out one apiece, earning the win in his first professional decision. Frank Montas was next with 4.0 dominant shutout innings, giving up two hits and striking out five. Nick Moore had a fourth inning two-run homer, his third blast of the year. Mike Meyers also had a big night with the bat, going 2 for 3 with a walk, a pair of doubles, a run scored and two RBI. The DSL Red Sox knocked off the DSL Yankees2, 4-3. Entering the top of the ninth with the score knotted a three, Aneudis Peralta singled to center to lead off the inning. After Peralta moved up to second on a sacrifice bunt, Roberto Duncan tripled, scoring Peralta with the go-ahead run. Keivin Heras got the start, allowing three runs on nine hits in 5.0 innings, striking out three without walking a batter. The 17-year-old Heras maintains a 1.68 ERA on the season. Emfember Martinez got the win for his 3.0 perfect innings of relief, striking out three and moving to 2-0 on the season. Leonel Vazquez allowed a pair of hits in the bottom of the ninth but escaped with his seventh save. 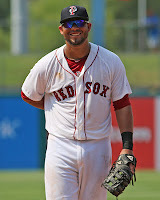 Player of the Day: Deven Marrero hit a dramatic 13th inning home run to help Lowell continue its winning ways. The shortstop had been slumping to a 4 for 41 line in August prior to his extra-inning blast. Cup of Coffee 8/11: Mookie Betts helped the Spinners to continue to stay hot, 2012 third-round pick Austin Maddox made his professional debut in the Gulf Coast League, and a combination of great pitching performances helped the DSL Red Sox shutout the DSL Yankees. The PawSox scored at least a run in each of their first three innings to defeat the Rochester Red Wings (MIN), 9-3. Daisuke Matsuzaka allowed two runs on five hits over 4.2 innings, striking out three and walking two in his ninth rehab start with Pawtucket. Matsuzaka allowed a two-run home run in the first inning, but recovered nicely, retiring the next three batters he faced. Nelson Figueroa followed, allowing one run on four hits over 4.1 innings for the win. Jason Repko led off the game with a home run to put Pawtucket on the board. The PawSox quickly reclaimed their lead in the second inning with RBI doubles from Nate Spears and Jose Iglesias. Dan Butler hit a two-run single with the bases loaded, and Repko hit a two-run double to put the game even further out of reach in the third inning. Danny Valencia hit a two-run double in the sixth to add insurance runs. Jose Iglesias was 3 for 5 with a double and a RBI. It’s the second time in three games that the shortstop was 3 for 5. Stolmy Pimentel could not escape a troublesome sixth inning, and the Sea Dogs fell to the Erie SeaWolves (DET), 7-2. After giving up a two-run home run in the first inning, Pimentel pitched four scoreless innings before unraveling in the sixth inning. Pimentel could not escape the sixth after allowing five of the first six batters to reach base, and reliever Chris Martin could not do much to stop the bleeding. The SeaWolves broke the 2-2 tie and tagged the two for seven runs. Pimentel gave up seven runs on seven hits over 5.1 innings. Travis Shaw produced the only two Sea Dogs runs, with a two-run home run, his 17th of the season, in the fourth inning. Xander Bogaerts continued a smooth transition to Double-A, having his second two-hit game in a row. The Salem Red Sox mustered only three hits and fell 9-1 to the Wilmington Blue Rocks (KC). The Red Sox scored their sole run in the first inning on a sacrifice fly from Michael Almanzar. Manuel Rivera lasted only 3.2 innings, allowing three runs on four hits. Michael Gleason fared worse, getting tagged for five runs on five hits and walking two in his sole inning of work. Jeremiah Bayer’s only vice was surrendering a solo home run in his 2.1 innings of work, and Pete Ruiz pitched an inning of scoreless relief. The Greenville Drive lost in heartbreaking fashion as the Savannah Sand Gnats (NYM) scored their winning run on a throwing error from Tyler Lockwood in the bottom of the ninth to defeat the Drive, 3-2. The Drive initially had a 2-0 lead thanks to a RBI single from Jordan Weems in the fifth inning and Bryan Johns scored on a fielder’s choice. The lead did not last long, though, as Dylan Chavez surrendered a crucial, two-run double. Lockwood inauspiciously loaded the bases to start the ninth inning, and his throwing error resulted in a Sand Gnats victory. Jason Garcia started the game for the Drive, throwing 1.0 inning, allowing a hit, a walk, and a strikeout. Nefi Ogando piggybacked and threw 4.0 nearly perfect innings, the only blemish being a walk. It was Ogando’s third consecutive scoreless outing. Mookie Betts (pictured) was 3 for 5 with three RBI to lead the Spinners to a 9-5 victory over the Hudson Valley Renegades (TB). It was the Spinners' 12th victory in 14 games. 2012 first-round pick Pat Light started the game, allowing an unearned run on two hits over 3.0 innings, striking out four and walking none. Tyler Wilson pitched 2.0 scoreless innings, but could not find his command in the sixth inning, allowing his first four batters to reach base, which resulted in three runs and a tied game. He allowed three wild pitches. Gerardo Olivares picked up the victory, allowing a run on two hits over 2.1 innings of work, and Yunior Ortega picked up the save. The Spinners wasted no time, jumping out to a three-run lead in the first inning. David Chester hit an RBI single and scored all the way from first on Mookie Betts' two-run double. The Spinners added a run in the second on a sacrifice fly from New York Penn-League All-Star Dreily Guerrero. The Spinners responded quickly after the Renegades tied the game, scoring two runs on a sacrifice fly from Chester and a single from Betts. Mike Miller added two more runs with a home run in the eighth, and Aneury Tavarez added one more in the ninth with a RBI double. The GCL Red Sox were able to squelch an eighth-inning threat to defeat the GCL Twins, 8-4. Third round pick Austin Maddox made his professional debut, throwing the first inning, and notched his first strikeout. Sergio Gomez pitched the majority of the game, tossing 6.0 scoreless innings, allowing only two hits and striking out six. Carlos Pineda ran into some trouble in the eighth inning when he loaded the bases after a fielding error from Cleuluis Rondon. The four runs were futile, though, as the Red Sox already had a seven run lead. The Red Sox scored their first three runs in the third inning when Iseha Conklin scored on a throwing error, and Nathan Minnich hit a two-RBI single with the bases loaded. The Red Sox continued to pad their lead when Keaton Briscoe forced a bases-loaded walk and Mike Meyers hit a RBI single with the bases loaded. Former GCL Red Sox Jeremias Pineda (part of the Danny Valencia trade) prevented more runs from scoring on that hit, throwing out Briscoe at home. The Red Sox added two more insurance runs in the eighth inning on a RBI single from Conklin and a sacrifice fly from Tzu-Wei Lin. David Sopilka responded to the Twins’ four-run eighth inning with a RBI single in the ninth. Dioscar Romero, Yankory Pimentel, and German Taveras combined to shut out the DSL Yankees, 4-0. Romero started the game, scattering three hits over 5.0 innings, striking out seven for the win. Pimentel threw 3.0 innings, allowing only two hits and striking out three for the hold. Alixon Suarez put the Red Sox on the board in the first inning with a RBI single. Andres Garcia added a run in the third when he led off the inning with a double, stole third, and scored on a sacrifice fly from Manuel Margot. The Red Sox added two more insurance runs in the bottom of the seventh when Ricardo Andujar walked to begin the inning, stole second and scored on a RBI single from Andres Garcia, who advanced to second on the throw. Suarez came through again with another RBI single. Player of the Night: Mookie Betts had his second 3 for 5 game in as many days. The two games snapped an ugly 1 for 18 slump. Betts was responsible for three of the nine Spinners runs. The 2011 fifth-round pick is batting .267 in 47 games with 13 stolen bases for the Spinners this season. As you may have heard, #1 prospect Xander Bogaerts (pictured) was promoted to Double-A Portland yesterday, and promptly introduced himself to Eastern League pitching with a 2 for 5 performance that included a game-deciding sixth inning home run. SoxProspects.com senior columnist Jon Meoli details Bogaerts' rise in a column for ESPN Boston. Ben Buchanan gives his take on the Bogaerts promotion at Over the Monster, and points out the he is six months younger than Hanley Ramirez was when he debuted for Portland. Before his promotion, he was named the Carolina League Offensive Player of the Week by MILB.com. Pitchers Josh Fields and Steven Wright move up from Portland to Pawtucket. Fields, 26, finished with a 2.62 ERA in 44.2 innings with the Sea Dogs, and made his Pawtucket debut with a scoreless inning on Sunday. 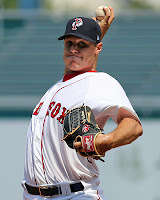 The knuckleballer Wright made one start for Portland following his acquisition in a deal for Lars Anderson, and is scheduled to pitch for the PawSox this weekend. Catcher Dan Butler joins Fields and Wright in Pawtucket. He is 3 for 13 with a double in four games since the promotion. Pitcher Brandon Workman and catcher Christian Vazquez were promoted from Salem to Double-A Portland, along with Bogaerts. Ranked #15 and #31, respectively, on SoxProspects.com, they are the two highest regarded prospects on the move this week. Mike McCarthy advances to Salem after completing his Greenville career with 22.0 consecutive scoreless innings. He is scheduled to make his Salem debut on Sunday. Seventh round draft choice Kyle Kraus out of the University of Portland was promoted to Greenville after posting a 2.61 ERA in ten appearances at Lowell. Relief pitcher Garrett Mock was traded to the Houston Astros for cash considerations. Mock was signed in the offseason as a minor league free agent. He made 35 appearances out of the PawSox bullpen, compiling a 3.33 ERA in 48.2 innings. July's Player of the Month winner Jeremias Pineda was traded to the Minnesota Twins in exchange for third baseman and former University of Miami standout Danny Valencia. The second runner up in the 2010 Rookie of the Year balloting, Valencia had spent most of this season with Triple-A Rochester after a tough sophomore campaign last year. He was assinged to Pawtucket. The Red Sox journey of Justin Erasmus came to a close. The South Africa-born, Australia-raised 2007 signee was named a preseason All-Star by the SoxProspects.com community, but battled injuries and ineffectiveness all season, finishing with a 9.24 ERA in 49.2 innings pitched. See his interview with Jon Meoli from August of 2011. Ben Badler of Baseball America reports that the Red Sox have signed Dedgar Jimenez, a 16-year old left-hander out of Venezuela, giving him a $175K signing bonus. The scouting report states that Jimenez "shows good pitchability for his age with a fastball up to 88-89 mph and flashes feel to spin a curveball" but also has an "extra-large, David Wells-type frame." Cody Kukuk made his long-awaited debut, this week, allowing a run on in 2.0 innings over two appearances out of the bullpen for the GCL Red Sox. The 2011 seventh-rounder was given an $800K signing bonus, but missed the first several months of the 2012 season on the restricted list. The Red Sox signed 40th round pick Kevin Heller out of Amherst College, and assigned him to the Gulf Coast League. As a college senior, the July 15 signing deadline did not apply in this case. SoxProspects.com Northeast Scout Ian Cundall published The Book on supplemental first round pick Pat Light. Three members of the Lowell Spinners were named to the New York-Penn League All-Star game, set to take place on Tuesday, August 14 in Mahoning Valley, OH. Infielder Dreily Guerrero (pictured), hitting .286/.348/.333 with ten stolen bases, and pitcher Francisco Taveras, sporting a 4-1 record and 1.82 ERA in 49.1 innings pitched, will be traveling to Ohio. Pitcher William Cuevas, with a 5.2 record, 1.61 ERA (3rd in the league) and 50 strikeouts against only 12 walks in 56.0 innings pitched, was named to the team but will not be making the trip. Bryce Brentz spoke with Andrew Pentis of MiLB.com about the adjustments he made to break out of his slump in a big way on Sunday. Brentz went 3 for 5 with five RBI, falling a triple short of hitting for the cycle. Rehab continues for Andrew Bailey. He made consecutive appearances for the first time on Wednesday and Thursday for Pawtucket, throwing a scoreless inning in each outing. 8/10 Cup of Coffee: In his first appearance in a Sea Dogs uniform, Xander Bogaerts (pictured) homered to give Portland the victory. Elsewhere, the DSL Red Sox split a doubleheader as they try to make a playoff push, and Lowell continued its winning ways. Pawtucket fell into an early hole and could not claw back, falling to the Syracuse Chiefs (WAS) in a 6-3 decision. A Danny Valencia throwing error led to five unearned runs in the third inning off of Billy Buckner, who fell to 4-6. Andrew Bailey pitched an inning of relief as he continues to rehab and looked sharp, striking out two and giving up one hit. It was the second scoreless inning in as many days for Bailey. Daniel Bard followed, giving up a run on one hit and two walks while striking out one in his lone inning. Jose De La Torre added 2.0 shutout innings, striking out three. Nate Spears was the offensive standout, going 2 for 3 with a third-inning solo home run. The Double-A debut of Xander Bogaerts could not have been scripted any better, as the 19-year-old shortstop led Portland to a 5-3 victory over the Akron Aeros (CLE). After being called up from Salem earlier in the day and finding himself hitting sixth in the Portland lineup, Bogaerts led off the sixth inning with a shot over the center field fence to break a 3-3 tie. Portland never relinquished the lead, and the blast made a winner out of Jeremy Kehrt, a fifth consecutive victory for the right-handed starter. Since the All-Star break, Kehrt is 5-0 with a 1.97 ERA. Bogaerts finished the night 2 for 5, and a cast of his former Salem teammates pitched in. At the plate, Jackie Bradley went 1 for 4 with a walk and a run scored, while Travis Shaw also had a 1 for 4 evening, adding a walk and a double. On the mound, Ryan Pressly and Michael Olmsted each added 2.0 scoreless innings of relief to secure the victory, with Olmsted credited with his second save. 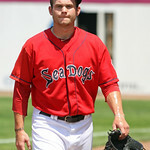 With Bogaerts moving on, Salem could not generate much offense in a 3-2 loss to the Carolina Mudcats (CLE). Yeiper Castillo had a strong start, tossing 6.0 innings, allowing a pair of runs on six hits while walking one and striking out seven. Andrew Jones took the loss in relief, giving up a run in his 3.0 innings of work. Heikier Meneses and Adalberto Ibarra had matching lines, both going 2 for 4 with a triple, but it was not enough, as Salem dropped the rubber match of their three-game series. Greenville's contest against the Savannah Sand Gnats (NYM) was called after the first inning because of rain. The two will play a doubleheader this afternoon. Lowell remained red hot, knocking off the Brooklyn Cyclones (NYM) 3-1 to win their eleventh in 13 games. Brian Johnson got the start and was again sharp, throwing 2.0 hitless innings, striking out two. The Red Sox second pick in the first round of the draft has yet to allow a run in 5.1 innings across his first three starts. Jacob Dahlstrand allowed just one run on three hits in 5.0 innings to pick up the victory, and Braden Kapteyn struck out four in his 2.0 hitless frames to earn the save. After falling in a 1-0 deficit in the sixth, the Lowell offense kicked in during the bottom of the inning. With one out, David Chester knocked a solo home run to even the score at one. Mookie Betts followed with a single, and Matt Marquis hit a two-run blast to give the Spinners the lead. Betts and Marquis both had three-hit nights for Lowell. A ninth-inning rally for the GCL Red Sox fell short in a 7-6 loss to the GCL Rays. Jose Colorado and Miguel Rodriguez both had RBI doubles in a three-run bottom of the ninth inning, but it was too little too late. Matt Spalding had another solid performance on the mound, allowing one unearned run on three hits in his 4.0 innings of work, striking out four and walking only one. Cody Kukuk made his second relief appearance, giving up a run and striking out two in 1.0 inning. Rodriguez had two hits off the bench for the Red Sox, while Tzu-Wei Lin and Iseha Conklin both chipped in with a pair of singles. The DSL Red Sox dropped the first game of their doubleheader with the DSL Pirates1, 5-0. The offense was shut down by Pirates pitching, managing only three singles in the contest. Starting pitcher Randy Perez took the loss, allowing 4 runs on six hits in 2.0 innings of work. Revenge was sweet in the nightcap, however, with the Red Sox emerging with the 2-1 victory. The offense again had its struggles, managing only four hits, but one of them was a two-run, sixth-inning homer by Alixon Suarez. Luis Ortega earned the victory. moving to 5-3 on the season by allowing just one run on three hits in 5.0 innings. Carlos Garcia and Leonel Vazquez pitched in with a scoreless inning apiece to hold on to the victory. Player of the Day: Xander Bogaerts. On the evening the Red Sox top prospect is promoted to Double-A, his solo home run proves to be the game-winning hit. Adding to the excitement, Bogaerts is the fourth youngest player at Double-A or higher, following phenoms Jurickson Profar, Dylan Bundy and Bryce Harper. 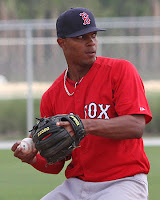 SoxProspects.com Player of the Week Salem's Xander Bogaerts recorded a .542/.607/.792 (13-for-24) line in six games last week, with six doubles, scored six runs, batted in four, took four bases on balls without striking out, and stole a base as a runner. After going hit less in his first game of the week, Bogaerts was consistently good, but highlighted his week going 4-for-4 with two doubles, three runs scored, one RBI and a walk August 4 against Wilmington (KC). Bogaerts batted .302/.378/.505 (116-for-384) with 15 home runs, 27 doubles and three triples over 104 games with Salem before being promoted to Portland August 9. 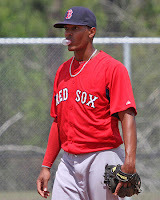 He is currently the top rated prospect in the organization by SoxProspects.com. For the second week in a row a pitcher from the the GCL Red Sox claimed SoxProspects.com Pitcher of the Week honors, right-handed pitcher Jeffrey Wendelken. In two appearances last week, each out of the bullpen, Wendelken worked 4.1 innings of, no-hit, shutout pitching, falling a single walk short of perfection while striking out five opposing batters. In nine games with the GCL Red Sox Wendelken owns a 2-0 record, one save, and a 0.53 ERA, allowing one earned run on six hits over 17.1 innings pitched, striking out 20 while walking only two, and holding opposing batters to a .109 batting average. 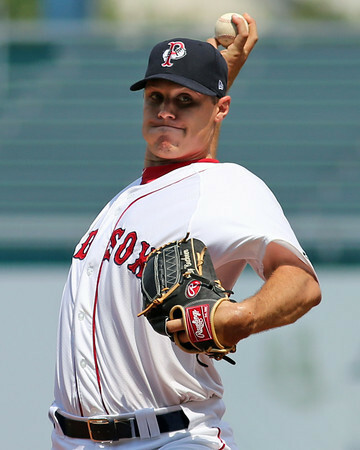 Windelken, age 19, was the Red Sox 13th round pick in this years draft out of Middle Georgia College.